Many of us only think about cranberries when it comes time to eat our Thanksgiving turkey. But apart from the holidays, we tend to forget these shiny, scarlet gems and the many ways they can be used. Why not add some color and sparkle to other meals throughout the year with these festive, good-for-you berries? Adding cranberries to your repertoire will brighten up your dishes, open you up to new taste experiences (try some cranberry sauce on a hamburger, for example) and improve your health as well. Studies show that eating a variety of colorful fruits and vegetables every day is key to a longer life. 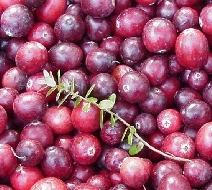 Cranberries are rich in antioxidants such as Vitamin C, flavonoids, and phenols — and also fiber and other substances that help protect against health problems like urinary tract infections, and chronic ailments like cancer and diseases of the heart, mind (Alzheimer disease), and even mouth (gingivitis and gum disease). Fresh cranberries are typically sold in 12-ounce bags, which makes about 3 cups when chopped. Dry-harvested cranberries, i.e. those not harvested in water, can be kept in a cool room of the house, preferably a basement, for as long as four months or more, and—discounting those that will have rotted during that time—still taste like the day they were picked from the vines! Or, they can be frozen, unopened, for upwards of nine months. Cranberries can be added to countless dishes, from quick breads, yeast breads, salads, relishes, salsas and chutneys, to soups, grain-based entrees and of course, desserts. Add a half-cup of chopped cranberries to your favorite banana bread or apple muffin recipe. Drop some into your leafy green/spinach salad (especially good with dried cranberries), or toss a handful into a pilaf or stuffing. Impress your dinner guests with a cranberry glaze, or slow-cook some berries with your favorite chicken or pork. Before baking apples, fill the cored centers with cranberries, then sprinkle with sugar and cinnamon. How about trying some cranberry catsup? Or, for a delicious cranberry mustard that will have pork and salmon singing on your plate, just heat some whole-berry cranberry sauce with a touch of sherry and honey, mix with an equal amount of your favorite brown or Dijon-style mustard, and if you like, throw in a dash of ground ginger. However you think to use them, cranberries are sure to add color and significant nutrition to all of your tasty creations! Prepared by Heather Armstrong, homemaker, and Charles Armstrong, Cranberry Professional, University of Maine Cooperative Extension. 2007. Updates: 2009 and 2019.